TORONTO, ONTARIO, September 29, 2017 – Let Lexus treat you to world-class luxury and transport you in unforgettable style, with the 2018 Lexus ES series of elegant luxury sedans. Whether you choose the conventionally-fuelled ES 350 or the hybrid-powered ES 300h, the ES will ensure that every journey is its own reward. Curbside, it’s easy to see why the current generation ES is considered the most striking ES yet. Sleek, sculpted styling lines run front to rear, evoking a sense of powerful yet composed movement, while the wide stance holds the promise of an elegant yet responsive drive. More than just good looks, this aerodynamic design also enhances ride comfort, reduces noise, and boosts fuel efficiency. The pronounced signature Lexus Spindle Grille is complemented by L-shaped Arrowhead LED daytime running lights. The low-beam headlamps, the fog lamps and the tail lamps are also LED, projecting a singular, high-tech appearance while improving longevity, efficiency, and illumination. And the long wheelbase signals the generous cabin space that awaits driver and passengers. Inside, the ES rewards the guests through multiple senses. Sculpted 10-way power adjustable front seats are both heated and ventilated, and hold driver and front passenger in an ergonomic embrace. The long-layered instrument panel places information displays directly in the driver’s line of sight. The whole is set off by artistic detail that only a handful of craftsmen can provide, including genuine stitching by one of 12 specially-trained “Takumi” masters. There’s room for three more in the back seat, and the ES offers those passengers more space for relaxation than most other vehicles in its class, with ample head and leg room courtesy of a lowered seating position and carefully sculpted front seat backs. Seats are wrapped in the soft comfort of NuLuxe upholstery. Soft close windows help create a whisper-quiet environment. Under the hood, the 2018 ES offers a choice of two powerful yet efficient drive systems. The ES 350 is fuelled by an exceptionally advanced 268 peak horsepower 3.5L V6 Engine with Dual Variable Valve Timing with Intelligence (VVT-i). Mated with a 6-speed Super Electronically Controlled Transmission (ECT), the ES 350 delights drivers with smooth shifts and enhanced performance at all speeds. The ES 300h is built around the popular and proven Lexus Hybrid Drive. This features a highly efficient 2.5L four-cylinder Atkinson Cycle gasoline engine, high-torque electric motors, a continuously variable transmission, powerful storage battery and sophisticated powerful management system. The ES 300h provides a combined 200 Net HP for a smooth, engaging driving experience, in combination with unmatched fuel efficiency and low emissions. Both powertrains feature the Drive Mode Select system – allowing the driver to modify the vehicle’s response to suit the moment. The system includes Normal, ECO, and Sport modes, plus an EV mode on the ES 300h. The 2018 ES features a powerful and precise suspension architecture that delivers enhanced stability to maximize driving pleasure, supplemented with tuned shock absorbers and increased body rigidity. Lexus engineers have also finely tuned ES so that noise, vibration, and harshness are dramatically reduced. Every 2018 Lexus ES 350 and ES 300h includes an impressive complement of standard features, such as Lexus Display Audio with 8” screen, Bluetooth® connectivity and integrated Sirius XM Satellite Radio, the Smart Key System with Push Button Start, a 4.2” multi-information display that presents key data at a glance, an ECO Drive Monitor, Intuitive Parking Assist, clearance and backup sensors, and more. Safety is also built into every ES. The Lexus Safety System + offers a host of class-leading advanced safety features, including the pre-collision system with pedestrian detection function, dynamic radar cruise control, lane departure alert with steering assist function, and automatic high beams. Other standard safety features include a backup camera, 10 airbags, ABS with brake assist and electronic brakeforce distribution, a tire pressure monitoring system with auto location, and more. The 2018 Lexus ES 350 with Touring Package (Starting MSRP: $48,000) adds a heated, wood grain and leather-wrapped steering wheel, power tilting/telescoping steering column, wood grain interior trim, a navigation system with the Lexus Remote Touch interface and in-dash DVD system, the Blind Spot Monitor and Rear Cross Traffic Alert safety technologies, a driver’s seat memory system, leather seat surfaces, a power rear window sunshade, LED high-beam headlamps, and the auto-levelling headlamp system. The 2018 Lexus ES 350 with Executive Package (Starting MSRP: $53,750) builds on the Touring Package, adding a 15-speaker Mark Levinson Audio system, more driver seat adjustments, a passenger seat memory system, premium leather seating, a rear door sunshade, automatic powered opening and easy-close trunk, LED ambient lighting, a panoramic glass roof, and unique 18” alloy wheels. The 2018 Lexus ES 300h with Touring Package (Starting MSRP: $51,050) adds a heated, wood grain and leather-wrapped steering wheel, power tilting/telescoping steering column, wood grain interior trim, a navigation system with the Lexus Remote Touch interface and in-dash DVD system, the Blind Spot Monitor and Rear Cross Traffic Alert safety technologies, a driver’s seat memory system, leather seat surfaces, a power rear window sunshade, LED high-beam headlamps, and the auto-levelling headlamp system. The 2018 Lexus ES 300h with Executive Package (Starting MSRP: $55,500) builds on the Touring Package, adding a 15-speaker Mark Levinson Audio system, more driver seat adjustments, a passenger seat memory system, premium leather seating, a rear door sunshade, automatic powered opening and easy-close trunk, and LED ambient lighting. 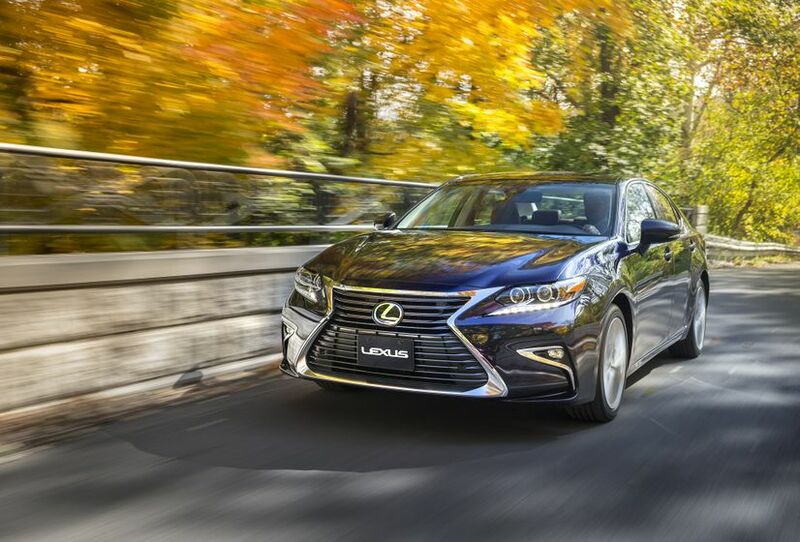 The 2018 Lexus ES series is now on sale at Lexus Dealers across Canada. For complete and up to date details and specifications, visit www.lexus.ca/es.